Midlife Happiness: What Makes You Smile? Here’s an excellent example of one man’s discovery of the happiness curve, and how it helped explain his mid-life funk: The Happiness Curve, And Why Your Midlife Isn’t A Crisis. One possible explanation for the U-shape of happiness is that as we move past 60, we become become less focused on getting ahead, and keeping up with the Joneses. We become more interested in relationships and making personal connections. That definitely makes sense to me and fits my experiences. 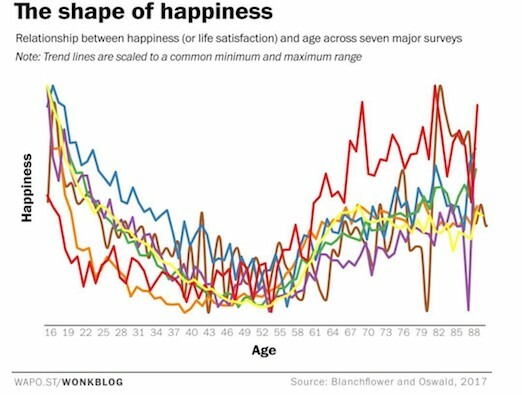 This composite graph (and great article too) combines seven different happiness surveys, and shows they track a similar path. They seem to predict we’re going to have a midlife crisis, and then come out the other side feeling good. Life definitely gives us some punches in middle age: health crises, empty nests, elderly parents to care for. We start understanding that we’re not immortal. And we all need reading glasses. That is interesting to note about happiness. I never thought about it in that way. The things that make me happiest now are being with friends and family. Any photo or situation that involves a small child is also something that always makes me very happy. I also love the smell of lavender and adore a good audiobook. I had never heard of the 50’s being a time to get depressed. That makes sense how I was feeling in my early 50’s. I’m afraid I took a rather drastic measure and got my Masters. I gave me something to have a goal for. Financially, I’m not sure how it panned out because I only taught for about eight years afterwards. But emotionally, it was exactly the cup of tea and was never sorry I did it. At 68, happiness is just taking my time and spending it on things and with people I love…works for me. At my current age I too find that it’s the “little things” that make me happy; a market trip followed by a hot chocolate with a friend on a Saturday morning, a great book, and of course, my cat’s deep and rumble-y purr. My happiness curve doesn’t follow the standard one though – it was pretty flat during my childhood and teenage years and then started on an incline in my mid-thirties. I’m with you on the chocolate too! and would add crafting, sewing, painting, creating, because these things make me feel so much better!. I was in a low mood some years ago, after my hubbie recovered from his illness. I had been so worried and busy taking care of him that when he recovered, I collapsed! (it’s something that happens frequently!) I think that I’ve learnt to manage some kind of equilibrium! So interesting. I’ve seen quite a few of my peers in the late 30s/early 40s absolutely lose their minds so I def think the mid-life crisis is real. I’ve read a ton of psychology articles in the past year, too. It’s so cool when people study and graph everything so we can understand human nature a little and get some insight into ourselves and a better perspective on the world around us. Add to the list of what makes me smile … reading Patti’s blog! I agree that after a certain age, our focus starts to shift. I’ve been reflecting lately on what things I’m doing on a daily basis and whether those things are/aren’t making a difference (however small) in the world around me. I’m trying to find other things to do that WILL make some kind of a difference, and those things are making me happy in a completely different way! I’m with you on the fresh sheets and chocolate. Substitute a pug for cats and I’m good : ) . Laughter truly is the best medicine, especially in our difficult world. I’m a bit worried that I may be heading towards a dip now…or maybe I had my dip in my mid 40’s when I was sick, fingers crossed that was it. One thing I’ve learned after living through a health crisis is that we tend to look at everything as permanent when we are in the moment. We can’t see beyond the pain. Losing hope makes everything impossible. The next time I face a similar challenge I will do my best to remember that, “this too shall pass”. Growing from those previous challenges may be what helps to shape our later years to become bright and optimistic. I learned that I am most happy when I relax and don’t worry, don’t think “what if…”, and when I trust life, and live in the moment, whatever it is I am doing – walking, writing, meditating, creating an outfit, giggling or enjoying a meal. I think the whole secret to happiness is in living here and now. So well said (natch, you’re a great writer!). And your last paragraph is good therapy for everyone, here and now, xox. I gamed the curve. I was career woman galavanting around the world until, at age 43 with a new husband, I had my first child. (At the OB-GYN practice, they called us “geriatric pregnancies.” Seriously.) So now I’m pushing 60 with a teen, who is absolutely is the sun that rises each day. I miss the career but I love being around my kid far more. Nobody has ever made me smile more. I tell my husband it’s a good thing we only had one because we probably wouldn’t get so lucky with such a perfect kid twice. When my kid heads off to college, my happiness is going to go off a cliff.